When it comes to legal issues, you want an attorney with a full and complete understanding of Oklahoma law handling your case. 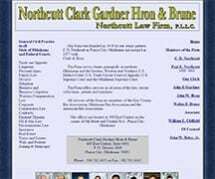 At Northcutt Clark Gardner Hron & Brune — Northcutt Law Firm PLLC, our founding goes back to 1938. We started in Ponca City before merging in 1977. We continue to serve those in Kay County, as well as Osage County. Family law: Issues related to family law are certainly sensitive in nature. Our lawyers understand this and will thoughtfully guide you through the legal process. We handle all types of family law cases, including those related to divorce and adoption. Estate planning: It is important for your last wishes to be known. Our law firm will help you put together a comprehensive estate plan. We know the law when it comes to wills, trusts and the probate process in Oklahoma. Business law: Business law is really an all-encompassing area of the law. We will handle all your business and corporate needs, including those related to real estate law and contracts. When it comes to finding solutions to your legal issues, you can trust in our decades of experience. At Northcutt Clark Gardner Hron & Brune — Northcutt Law Firm PLLC, we are dedicated to helping you resolve your legal issues in a way that makes the most sense for you and your family or business.